Traveling between Delaware and Interstate 270, motorists will see flashing signs stating that the resurfacing of State Route 315 begins Aug. 20. The Ohio Department of Transportation said the project is scheduled for completion by Oct. 30, weather permitting. The Ohio Department of Transportation will begin a two-month resurfacing project on State Route 315 next week. Work starts Sunday, Aug. 20 with completion expected by Oct. 30, weather permitting, according to ODOT spokesperson Nancy Burton. Crews will be on site from 7 p.m. to 5 a.m. daily. Flaggers will maintain one open lane of traffic at all times during the $1,021,242 repaving project. According to a press release, ODOT contractors will start at the Franklin County line, working north toward Delaware, resurfacing State Route 315 from Clubview Boulevard to Jewett Road in Delaware County, and then moving to north of State Route 750 and paving up to the U.S. 23 intersection in Delaware. The Ohio Department of Transportation started the $2.8 million project January 2017 to stabilize the Olentangy River slope that supports State Route 315. Officials said in order to maintain the highway, the slope needed stabilized because the river was moving toward the bank that supported the highway. ODOT determined that the best method with the least impact to the natural scenic value of the river bank was to construct a “plug pile” wall. The wall was constructed by drilling holes into the bedrock then inserting steel beams into the holes of the rock and pouring concrete into the holes to fill in around the beams. During construction, downtown Powell become a popular alternate route for motorists. Drivers used Powell Road to Liberty Road connecting back to Jewett, resulting in backups. In an effort to curtail the traffic, Powell’s city council approved a temporary measure June 20 prohibiting left turns from Liberty Street onto Powell Road during the hours of 4 to 7 p.m. on weekdays. The city’s police department directed traffic during peak hours working to smooth the flow and reduce the daily delays. 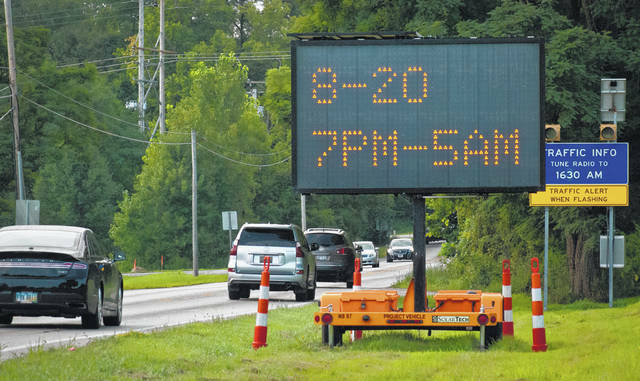 Liberty Township trustees also took action in June to alleviate traffic problems resulting from the closure between Jewett Road and State Route 750. The township hired off-duty sheriff’s deputies and police officers to direct traffic at the intersection of Liberty Road and Jewett Road in an effort to reduce congestion and eliminate motorists cutting through neighborhoods. According to ODOT’s website, 26,310 vehicles travel on State Route 315 per day with 34,710 vehicles traveling State Route 750 and crossing State Route 315 per day. Follow ODOT’s website at www.dot.state.oh.us/districts/d06/Pages/Home.aspx for road closures and traffic changes. This entry was tagged delaware, Liberty, ODOT, Powell, State Route 315. Bookmark the permalink.